The commissioner's office closed 67 or these 90 complaints, with the remaining 23 complaints still in process. This leaves only four, which the report describes two as being settled after negotiations between the parties, and two given the ambiguous category of "other". The complaint investigating mechanism was set up after a Senate enquiry report that cost undisclosed millions to deal with a "massive" problem with wind turbines. The National Wind Farm Commissioner's first annual report avoids two key issues. First, it doesn't mention how many complainants made the 90 complaints. The anti-wind farm "movement" in Australia is often busy plaguing politicians and the few supportive media outlets that give it time. This phenomenon is well known in government circles. In the last three months of 2016, just 10 people submitted half of Heathrow Airport's 25,000 noise complaints. The stock answer given here by wind farm opponents is that wind farm illness is like sea sickness: only a few get it. So in the whole of two states, and across 88% of wind farms, there's apparently no-one with susceptibility to wind farm illness. Former Prime Minister Tony Abbott, who described wind farms as "ugly", noisy" and "visually awful", threw the senate committee a giant political bone. The committee, and the Office of the Wind Farm Commissioner, put up their "we're open" shingle and invited the alleged throngs of suffering rural residents to air their problems. This annual report shows very few did, and the great majority of "complaints" dissolved by being sent information. Among other things, it is looking at only one year of operation. Wind farms, among other things, alter air temperature over regions, and that can be mistaken for climate change. Also,. Not,e this is happening in Australia, which regularly has hot weather. Also, Australia is largely uninhabited. It is not necessarily to be surprising that there be few complaints where there are few or no people. Note the convenient "surrogate" of individuals not progressing complaints being taken as "proof" the complaints were minor. Many realize, when trying to fight the crooks in power with their big money swindles, the likelihood is not great of getting any action stopping the swindle. 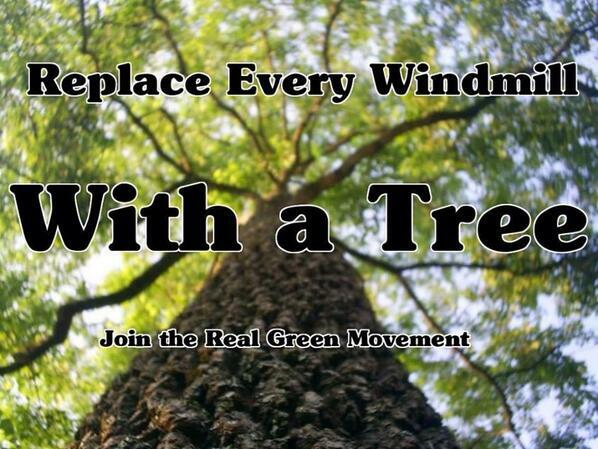 "Join the REAL Green Movement"
"Replace Every Wind Turbine With a Tree"
Windmills are proven ineffective to curb CO2 emissions, trees are much more effective and natural and do not slaughter birds and other endangered species in midair. Planting trees is usually a good idea. But when power is needed, fast, efficient and benign sources can be erected for wind and solar, and removed if necessary without huge disruption and contaminated land. Explain it to Greenpeace, they still use marine diesel to propel their vessels, convince them to trust only in Sunshine&Breeze to cross the oceans. Willie, we are talking about stationary power generation, not boat propulsion. Explain why when power is most needed, mainly at night or on cloudy days or during the winter, the intermittent renewable is on vacation, so it is fossil fuels that keep lights on in Germany. "Europe has increasingly invested in green energy in recent years, which has created big problems preventing blackouts during the winter." Explain why when power is needed, day or night or on cloudy days or during the winter, in fact every moment, the units at Fukushima are crackling holes of intense radioactivity. Explain why you favor this. In what sense "proven" ineffective to curb CO2 emissions? Please don't lie by making complete bullocks up. trees are much more effective and natural and do not slaughter birds and other endangered species in midair. I have news for you; man made global warming and toxic fumes and smoke from burning fossil fuels slaughter birds and other endangered speciesr. The temporal/geographical expanding BUSHFIRE SEASON is killing more trees, shrubs, grass AND birds/animals than ever, Willie. Just planting more trees (which is good thing but is not able to counter/absorb all the NEW FOSSIL CO2 put into the atmosphere) is not sufficient on its own. ONLY non-CO2-emitting alternatives are truly GREEN in the sense they are the ONLY way to PREVENT/REDUCE atmospheric CO2 increase which is now understood by all sane and objective observers on the farm/country and cities. THEY are seeing what AGW is doing NOW; let alone what it may do if AGW worsens because of lack of PROPER GREEN alternatives/action NOW. Good luck, Willie; you'll need it if you get your way, and the AGW disasters strike you and yours. I would add "twisted and evil" to the descriptions. Is there any wrong-doing we can't minimized into non-existence? How can "non-CO2-emitting alternatives backed up by fossil fuels to compensate intermittencies" be non-CO2-emitting and green? On the other side, carbon-free nuclear power is already scientifically recognized as the only way to stop global warming, while eco-friendly bird-choppers are a fiasco, e.g. Germany. 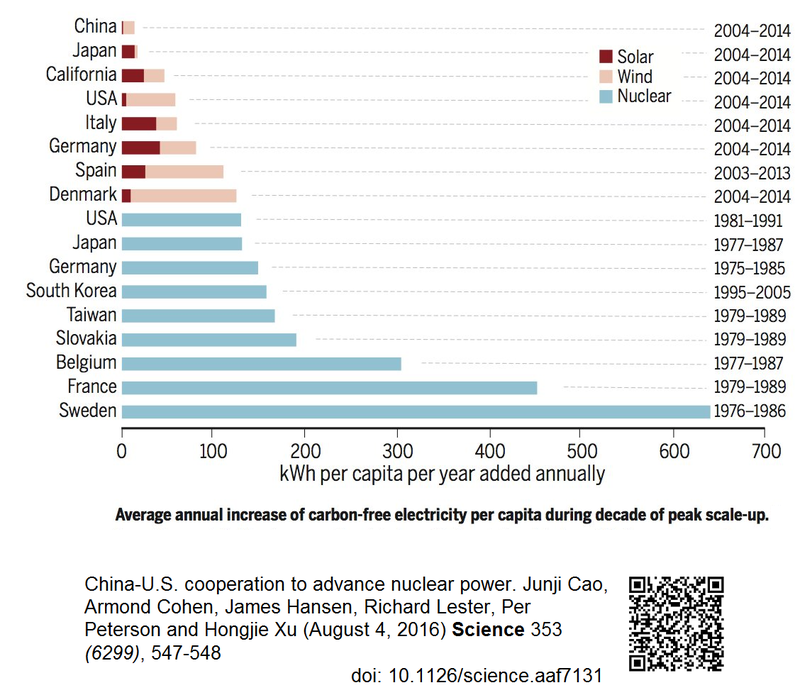 "Average annual increase of carbon-free electricity per capita during decade of peak scale-up"
"... to curb CO2 emissions, trees are much more effective ..."
MYTH!!! Trees do NOT curb CO2 emissions. At best it can be said that they STORE some CO2 for a short time. Willie, you are letting what is a temporarily unattainable perfection prevent the implementation of the attainable vastly improved. MYTH!!! Trees do NOT curb CO2 emissions. Are bird-choppers curbing CO2 emissions in Germany, California, Vermont, etc? NO. 100% renewable is just an ideology, a "Green's unicorn fairy fantasy", to lure taxpayers to waste their money on pipe dreams backed up by fossil fuels to keep lights on when there's no sun no wind. "Instead of the '100% renewables' mantra, we should instead be chanting '0% carbon'." Agreed, it is still an ideal. but every day it comes closer to reality. That depends on what you mean by "curbing." If you mean "reducing," then yes they are. If you mean "totally stopping," then not yet, but we're part way there. 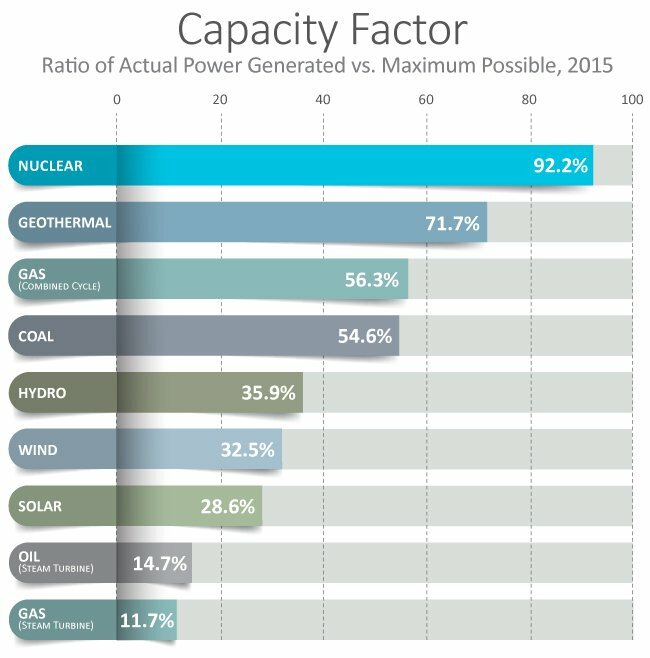 Every megawatt produced by renewables is one less that needs FF. Are you aware that chanting releases more excess CO2 than regular breathing? But go ahead, chant whatever pleases you. Every megawatt produced by renewables is one less that needs FF. Every installed-megawatt of intermittent renewables is one more megawatt that needs fossil fuels to keep lights on when sun is not shinning or wind is not blowing. Worse, if capacity factor of intermittent renewables is around 1/3, then 2/3 is from fossil fuels, which means that for each megawatt produced by intermittent renewables, it is needed two megawatts from fossil fuels. Intermittent will go away with batteries. If all that "intermittent" power is so bad, why are utilities racing to install it? 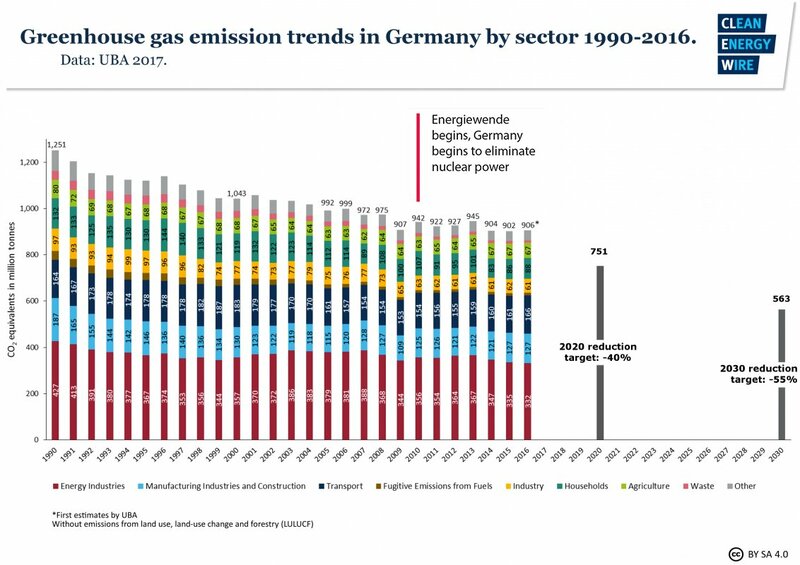 "With better than 95% confidence, no decline in German greenhouse gas emissions since Energiewende started"
No major commercial battery breakthrough since Li-phosphate 1996(two decades), it's a very mature technology, its physics is well known and understood, it is not expected any major breakthrough. "Batteries are crucial to clean-tech. 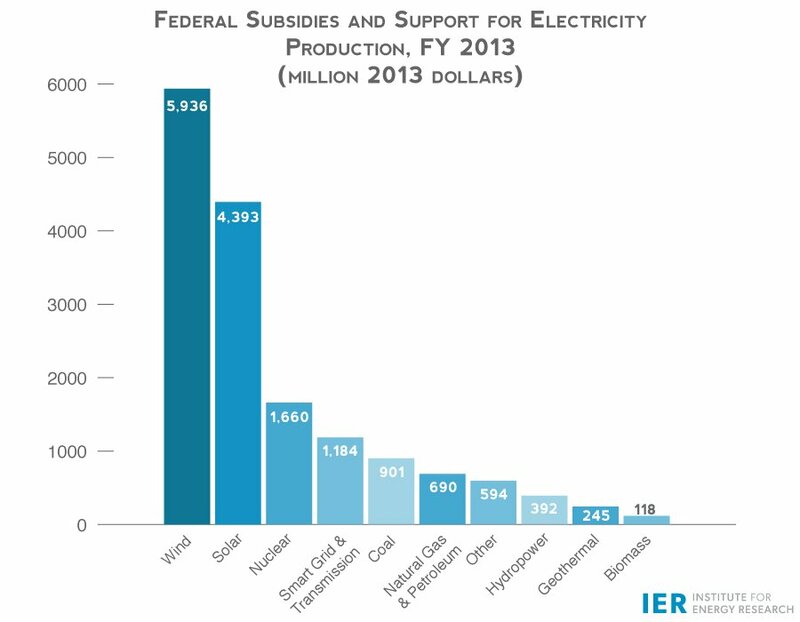 But their supplychain is far from clean"
And also "intermittent" power is good for the natural gas/fracking industry. 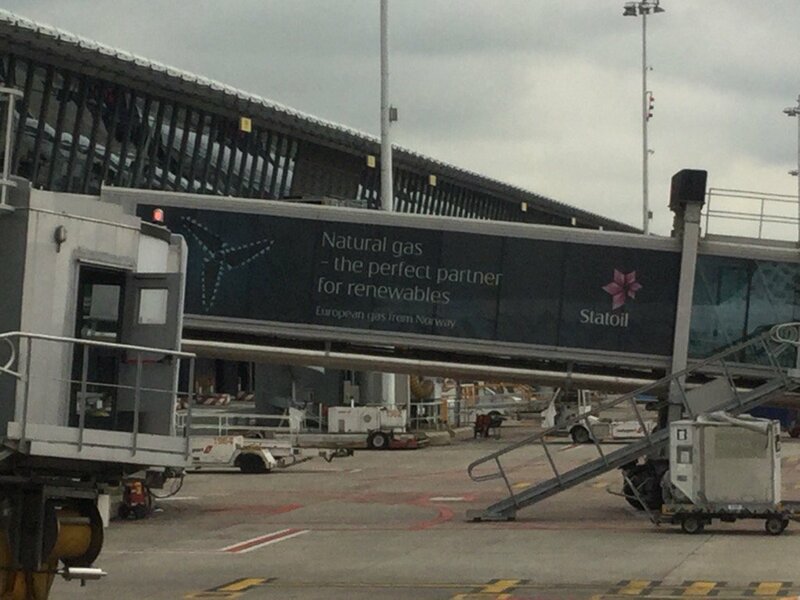 "Natural gas, best friend of renewables?" Well, Willie, if you keep regressing the goal-posts and changing the arguments, why are you here? You started by dissing wind turbines and have now arrived at "Modern Slavery, and Weakened Land and Water Rights" and I'm sure you will continue devolving your position all the way to the benefits of living in caves during the stone age if given the platform. It's time to get back into your mother's basement and continue chanting '0% carbon' while smoking your weed. Mate, what are you talking about? 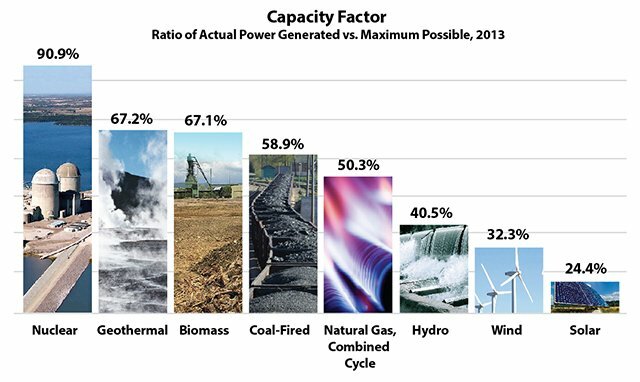 No-one here has ever said/wanted ALL fossil fueled power/other uses to cease altogether. Sane and practicable REDUCTION of the PROPORTION of CO2-emitting in a MIX of energy sources/generating is what ALL reasonable observers/scientists are seeking/recommending. Only 'fringe' extremists/saboteurs/propagandists who wish to SCUTTLE reasonable action NOW use that extreme 'all-or-nothing' BAIT to divide and confuse the debate/co-operative efforts towards attainable goals (because they are SHILLS and FALSE 'eco-warriors' funded by/for the fossil/nuclear lobbies and politicians trying to 'discredit' sane and reasonable efforts! They are NOT interested in YOU and yours, mate; only in DIRTY PROFITS NOW at whatever cost you you and your children in future, Willie). Anyhow, Wil, present Nuclear options costly/dangerous (nuclear weapons-grade materials 'proliferation', potential disasters affecting/costing longterm, etc etc). Agreed, once cheap none-toxic flow batteries are fully developed and commercialized, which, thanks to the recent advances in flow batteries, won't take too long! cheap long-lasting flow batteries for off-the-grid energy storage which have only cheap non-toxic non-corrosive recyclable chemicals in them thus making it at least one cost effective solution to intermittent power without a supergrid. so the above breakthrough is for cheap long-lasting flow batteries for off-the-grid energy storage which have only cheap non-toxic non-corrosive recyclable chemicals in them thus making it at least one cost effective solution to intermittent power without a supergrid. not that there is anything wrong with the supergrid solution; yet another solution. So, no breakthrough there yet. The supergrid schemes are ludicurous, and depend on political fairytales where e.g. Europe could depend on North Africa and the Middle East to not hold the transmission links on ransom. The word "still" is the operative word; they won't be for much longer. No, you can have a viable supergrid without Europe electrically connected to Africa or Middle East. please don't lie by making stuff up. Providing you can just get passed the stupid politicians (the only significant barrier), there is nothing "ludicrous" (spelling corrected) about it. And that is just one solution. Please don't LIE; I just showed you one breakthrough and you must know it unless you don't even BOTHER to read my posts. There are improvements being made to the technology all the time. According to "American Bird Conservancy", windmills are among the fastest-growing threats to birds and bats. "..hundreds of thousands of birds and bats die every year when they accidentally collide with turbine blades. Fragile-bodied bats can even succumb to the pressures created when the giant turbine blades pass through the air, a phenomena known as barotrauma." "wind energy development can also contribute to habitat loss and road and other infrastructure construction"
"When wind energy projects are located in or near major migratory routes, stopover sites, or key breeding or foraging areas, the losses are expected to be great. ABC believes that such high-risk areas should be avoided at all costs." "Any environmentalist against nuclear power is either uninformed or anti-human. Probably both." You betcha......A couple valleys across the countryside from where I live, a whole town got up in arms over the town Fathers & Mothers approving wind turbine installations at the top of a ridgeline overlooking some of the most beautiful countryside estates ever constructed in this section of the state. These homeowners willingly paid monumental property taxes just so they could live in that valley free from the clutter of suburban crowding that was adjacent to migratory bird & nesting habitats of a nearby State bird sanctuary for bald eagles. 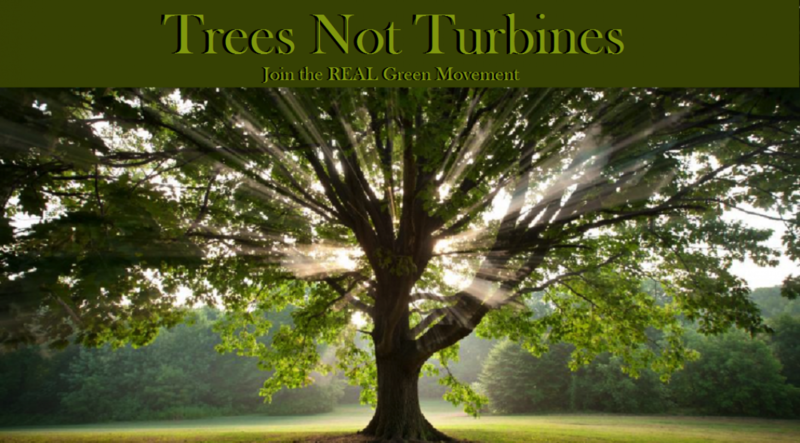 Municipal gov't greed for tax revenue approved a 30 unit turbine installation with no public hearings. You can bet this would have had gkam's & humy's approval in a flash. Gosh, Willie, any environmentalist who does not trust nuclear power either worked with it or knows about Chernobyl and Fukushima and PL-1. Benni, we are all sorry you folk did not get a new coal plant for that ridgeline. 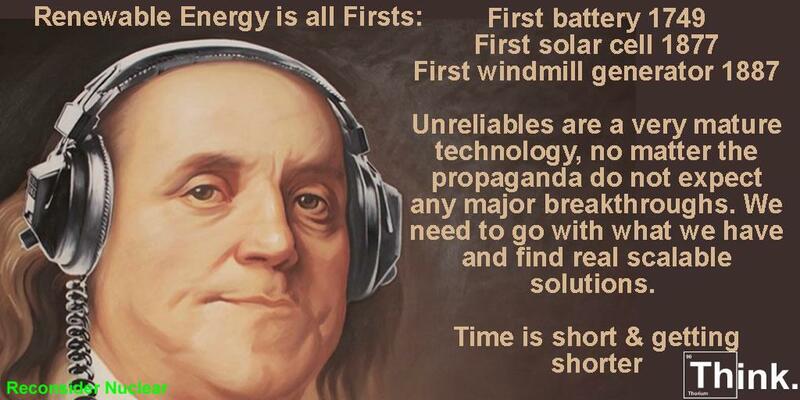 Maybe if you generated your own power like I do, you folk would not need the wind turbines. Outgrow it, Rumpy. I ticked you off and now you follow me around like a puppy, trying to piss on everything I say. You were never a captain of anything. I proved my service and you saw the awards I got. Try to outgrow the need to "get even" with others, the same dysfunction which drove you to hide in the woods. You can have a real life if you get help. We have little doubt the massive threat from burning fossil fuel to birds and bats dwarfs that from windmills that help reduce that threat from fossil fuel use. So if you TRULY are worried about the welfare of bats and birds in particular (please don't make as laugh), you would agree to the less harmful energy generation to them. Once again your references do not work. They are for show only, like your assertions you served in the military. You did not. It is not unusual for phonies like you to accuse others of their own sins, . . just like Trump. It must have been terrible for you to have read my performance reports in the service, especially the comments from the Commander and Avionics Officer. But let's get back to the issues here, shall we? The landscape here in California is different from that in the center of the nation, so our wind turbines are usually not near heavily-occupied areas. I know of no complaints about them here at all. It's time to stop calling intermittent renewable 'clean eco-friendly energy', it is an insult to human intelligence. Real data and statistics show us that carbon-free nuclear power is much more energy dense and it takes less land and causes fewer ecological impacts per unit of energy produced. The proposed "renewables" are to help to curb CO2 emissions and climate change, but in practice they are proven to be a fiasco, just a bunch of bird-choppers/landscape-destroyers mystical placebos backed up by fossil fuels to compensate intermittencies. Yup, we are retiring the costly fossil and nuclear powerplants and evolving into more ecologically friendly sources. And they do not run out, like uranium and coal and oil. And they do not pollute, unlike fossil fuels and the terrible problem, not yet solved, of how to even safely store the nuclear waste with which we are stuck. I have never heard of anyone specifically call renewables that but, in any case, renewables are our only economical viable hope of producing sustainable energy without doing long-term harm to future generations of people and you don't suggest any practical alternative to renewables so your criticism of it is moronic and makes no sense. Nuclear is currently just too expensive (and will be for the foreseeable future ) to be cost effective at meeting all the worlds energy demand while fossil fuels are just too pollution; that just leaves renewables as the only feasible solution. The problem of intermittency can be solved with flow battery and/or supergrid. Marine current power would be constantly available i.e. NOT intermittent. What would you have against Marine current power? How is it possible? If they rely on fossil-fueled grids to hide their intermittencies. "Let's be clear: solar and wind aren't 'clean' if natural gas backs them up." "(To be *actually* clear, these are both bad arguments.)" What is it that's always coming but never arrives? 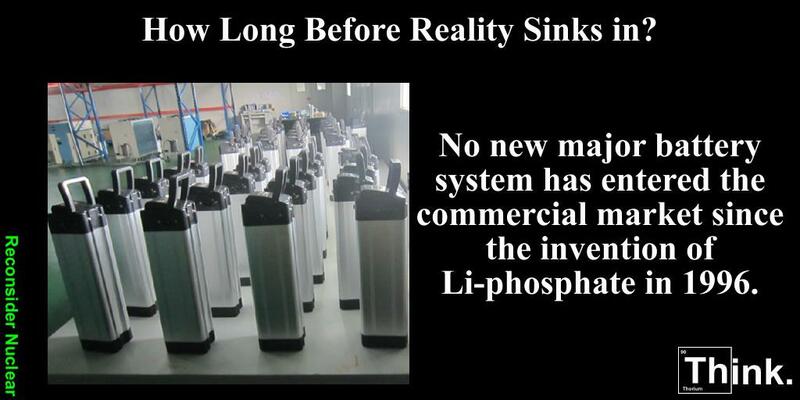 cheap energy storage(batteries), always 10 years away, if climate change depends on it then mankind is lost. "The typical turbine issues with blade strike, entanglement of marine organisms, and acoustic effects still exists; however, these may be magnified due to the presence of more diverse populations of marine organisms using ocean currents for migration purposes. Locations can be further offshore and therefore require longer power cables that could affect the marine environment with electromagnetic output." There isn't much marine life to endanger with blades for blades put in very deep ocean, which is where they are generally proposed to be put, too deep to impact most marine life. If you are so concerned about marine life, why are you promoting fossil fuel burning that will massively impact on all marine life? Sorry, don't believe you; I don't see how you can care about marine life and want to continue to pollute them to death. You have a political agenda nothing to do with concern about marine life. 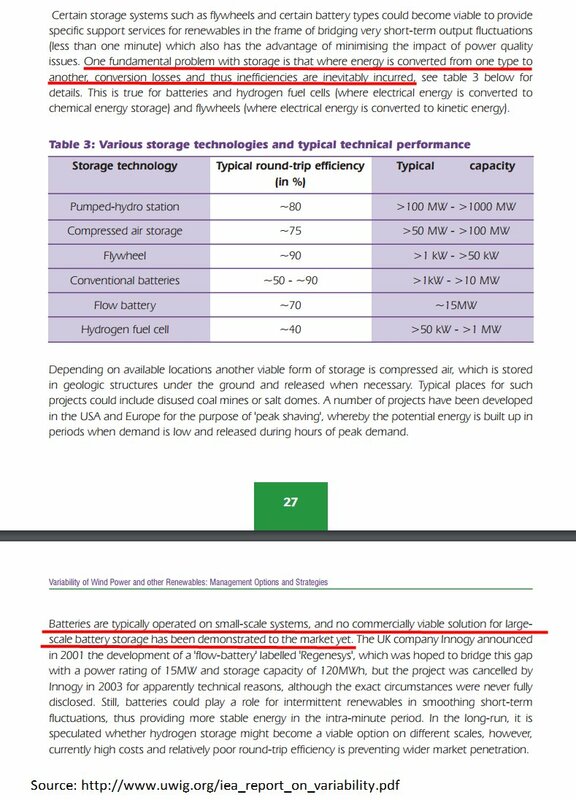 So you are saying that despite the continuous and inevitable improvements in technology, there will never be flow batteries? Wow what a total delusional moron you are. I already showed you one link showing the latest improvement, and that is just part of a series of improvements. Since they are almost there, it is just a matter of logic that, in a few more improvements time, there will be flow batteries. Filthy coal power stations causing global warming are bird-killing landscape-destroyers are neither ecologically friendly nor clean energy sources. So why do you favor them over wind power? Thanks to faux-greens, Germany is planning to build more 20 and Japan more 45 coal plants, South Asia more 400 coal plants. Antinuclear scaremongers and faux-greens have just served to induce mankind to get more stuck on fossil fuels than ever. But there is good news, a new hope to stop climate change. China, one of the largest manufacturers of wind and solar components, is investing heavily in nuclear power plants because they already know that intermittent renewables are a total fiasco in terms of greenhouse gas reduction. - Huge Govt/Social Subsidies for Coal/Nuclear, which could be better spent on more/quicker developments of safer, more economic, sustainable, alternatives having FAR less damaging effects on birds, animals AND Humans, Economy. Is your 'concern' balanced, Wil? Just for future reference, among the many threats to birds, more birds are killed by high-rise buildings and houses with picture windows than by wind turbines. The key term that Will is using is "fastest-GROWING." While it may be technically true, it is misleading hyperbole. When you see that term, dig deeper looking for the many similar threats that are growing less quickly. EG: Adding ten thousand new high-rises to ten million existing high-rises will kill more birds than one thousand new turbines added to one thousand existing turbines, but we have 100% growth in turbines and only 0.1% growth in new high-rise buildings. 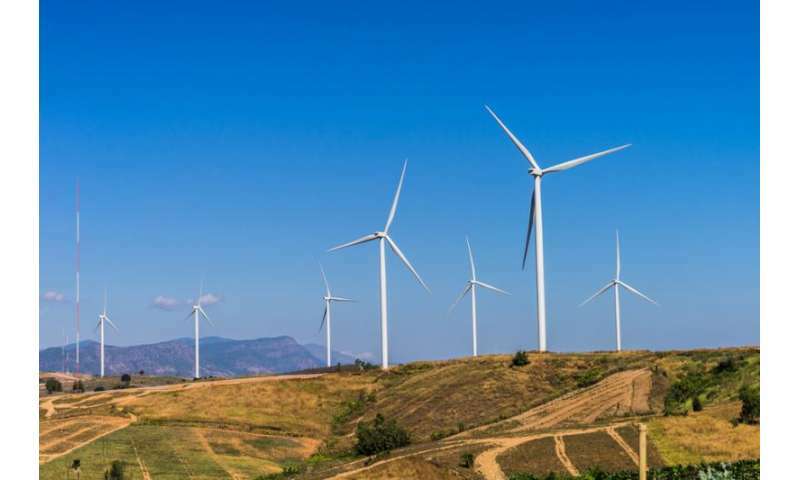 Even it killing millions of birds and needing tons of fossil fuels as backup, Eco-nuts believe intermittent renewable is eco-friendly and carbon-free. It is called "Cognitive Dissonance". None of those sites require 40 years and $190,000,000,000 to "clean up", do they? People receive more radiation flying in an airplane (65 mSv) than in Fukushima (20 mSv). 540 Sieverts at Fukushima, almost a hundred times the lethal limit. What kind of person does that to the Earth? It is inside the reactor, 540 Sieverts = 540 J/kg, it is hard to know accurately the spectrum, it could be mostly infrared radiation, or simply heat, probably 90% is thermal radiation. So do not put your head inside an oven, it is potentially much more lethal than Fukushima. It is lethal radiation, Willie, . . including Neutrons. A lethal dose in about 30 seconds. No one has died from radiation exposure at Fukushima. But two engineers have died from thermal radiation from a wind turbine; their bodies were exposed to an "unimaginable" lethal quantity of Joules/kg(Sieverts) of electromagnetic heat radiation. Not yet, that we know about. Let's include Chernobyl and PL-1. We cannot afford nuclear power, the Faustian Bargain of the 20th Century. the Faustian Bargain of the 20th Century. "Renewables", the scam of the 21th Century. That just served to induce mankind to burn more and more fossil fuels to keep lights on when wind is not blowing or sun is not shinning, which has led to millions of deaths every year due to air pollution. 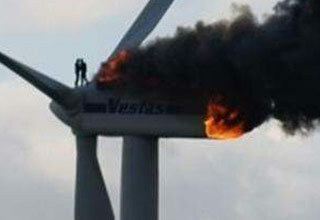 "The stampede of wind farm complaints that never happened"
-Yes well I have a complaint. They are obviously slowing down the rotation of the planet and we will end up having to supply power back to them to speed it back up again. Net zero. -Incidently for terraforming as well. Many farmers in the Midwest hear the sound of money.